Military service can change people. Service members may be away from family, friends and home for long periods of time. They may be at risk of injury or death. They may see comrades killed or wounded. They may have killed or wounded others, or been wounded themselves. Stress can become distress. Not all scars are visible. 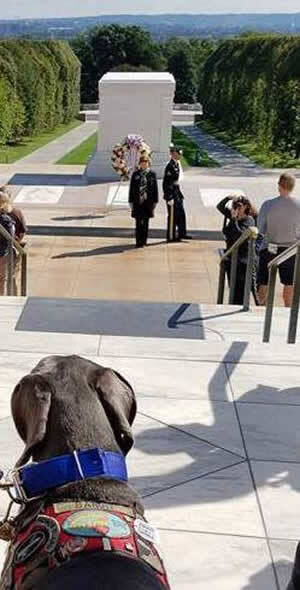 Bandit was invited to Arlington National Cemetery to oversee a wreath laying ceremony. Bandit understands. He endured a lot before he became a therapy dog and a comforting companion to thousands of troops at Fort Leonard Wood, Missouri. Bandit was a rescue, a puppy-mill puppy no one wanted. He was malnourished, had a misshapen front leg, mange, and what was believed to be a large tumor on his neck that turned out to be an abscess. At 16 weeks old, he was facing imminent euthanasia. Kelly Brownfield and David Gist of Waynesville, Missouri, had recently adopted Bandit’s brother, Duke. When Brownfield looked into the doomed dog’s eyes, she refused to let him be put down and adopted him too. For Brownfield, who shoulders considerable responsibilities as the director of the Fort Leonard Wood USO center, nearly every day became take-your-dog-to-work day. Dogs can feel the energy of other beings around them. They seem to understand human emotional needs and respond appropriately. A study published in the journal “Animal Cognition” found that a dog was more likely to approach someone who was crying than someone who was humming or talking. Additionally, dogs respond to weeping with submissive behavior. Dogs seem to try to placate a person who is upset. Further, dogs will approach anyone who is upset, regardless of whether that person is their owner. Dogs have big hearts. Bandit’s heart proved to be even bigger than his imposing stature: 3 feet tall at the shoulder and 170 pounds. Having healed from his own ordeals, Bandit was now healing others. He became a certified therapy dog in 2012. Brownfield estimates Bandit cheers about 1,500 troops every week at the USO center. He’s a regular at the base hospital as well. On Wednesdays, Brownfield and Bandit visit the St. James Veterans Home. He’s an official USO Comfort Dog. Susan Hinkle, Missouri Patriot Paws coordinator and Bandit’s tester at Therapy Dog, Inc., nominated Bandit for an American Humane Association Hero Dog Award for the unconditional love he shares throughout his regional community and the military community. In 2014, the University of Missouri College of Veterinary Medicine had the opportunity to return the care and comfort Bandit offers to so many. Bandit had developed a cranial cruciate ligament tear in a back leg. His veterinarian referred him to MU’s Veterinary Health Center for surgery. 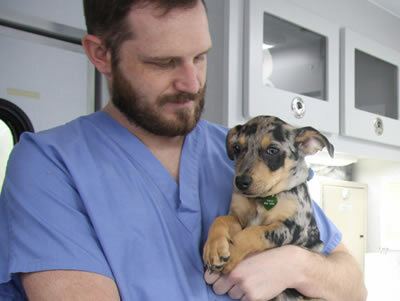 The VHC’s Small Animal Surgical Service is based in a state-of-the-art facility with exceptional resources and personnel. VHC veterinarians performed a tibial plateau leveling osteotomy. Due to the steep slope dogs have on the tops of their knees, the surgery involved making a circular cut in the top of the shin bone — the tibial plateau. Then, the contact surface of the bone was rotated until its orientation was relatively level. The surgeons then stabilized Bandit’s shin bone with an eight-screw plate and a 10-screw plate. While in Washington, Brownfield and Bandit visited the Pentagon and USO national headquarters. They also received an invitation to the Washington offices of National Geographicfor a photoshoot. The iconic magazine had selected Bandit as one of the world’s extraordinary dogs and planned to devote a chapter in a forthcoming book to stories from wounded warriors about what the Great Dane with the great big heart meant to their recovery. Then, in November 2015, the cranial cruciate ligament in his other back leg ruptured. Brownfield again rushed the hero dog to MU’s VHC. This time, Bandit battled several complications and barely survived. During the months of recovery, the dog’s Facebook page was flooded with posts from people around the world, pulling for him, praying for him. “I had to remember that Bandit doesn’t belong to just me, he belongs to the hearts of thousands, and many were breaking as he struggled to survive,” Brownfield recalled. Bandit recovered. After dropping to less than 100 pounds, he’s back to 170, a whole lot of dog on a selfless mission. The elite 3rd U.S. Infantry Regiment — The Old Guard — performs a special mission. The unit provides military funeral escorts about 20 times a day at Arlington National Cemetery and guards the Tomb of the Unknown Soldier, 24 hours a day, 365 days a year. These superlative soldiers make up the Arlington Honor Guard. They were so impressed by Bandit’s service, they invited him to oversee a wreath-laying ceremony at the Tomb of the Unknown Soldier. He is the first dog ever granted this honor. They also asked that he work with families of the fallen, helping them cope with grief and loss. Many nations remember the sacrifices of the fallen, the veterans and those currently serving in the military, perhaps one or two days a year. Bandit offers his special treatment to members of the military almost every day. Brownfield has many stories of disconsolate troops and wounded warriors who say Bandit brought them light when they were lost, love when they were lonely, and hope when they believed they were hopeless. Bandit’s challenge coin serves as a fundraiser for the USO. Military units began using challenge coins as far back as World War I, first as a recognition tool, later as a discreet way for service members to show pride their specific unit. A challenge coin would exhibit that the holder is a member of a group that shares a bond of commitment, loyalty and dedication. When members of the military want to show appreciation, sympathy or professional connection, they often distribute challenge coins. The coins can symbolize anything from a nod of appreciation to a deep, personal connection. Challenge coins are not currency. They don’t look like regular coins. Challenge coins are literally tokens of gratitude. They aren’t flashy displays of accomplishments, they are proof of special relationships. 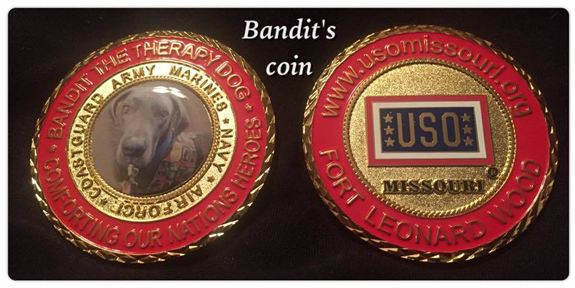 Bandit has his own challenge coin, which he uses to raise funds for USO Missouri. Bandit’s distinctive red and gold coin features his photo and the moniker, “Bandit the Therapy Dog, Comforting Our Nation’s Heroes.” The coins, and more information, are available on his Facebook page. 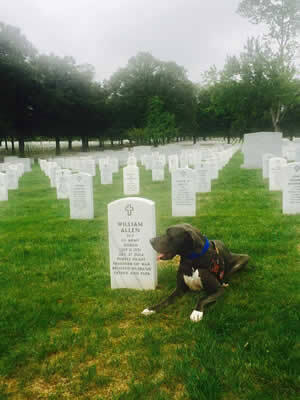 Dogs play a large role in the lives of soldiers and veterans. Military working dogs serve as scouts, sentries, trackers and in search-and-rescue operations. Some see duty at prison installations, others are trained to detect and locate explosives. Many military units adopt dogs as mascots. Guide dogs provide safety and companionship for wounded veterans. Working dogs have saved thousands of American lives and continue to impact the lives of thousands of veterans. To commemorate their service, the U.S. Military Working Dog Teams National Monument was dedicated in 2013 at Lackland Air Force Base in San Antonio, Texas.